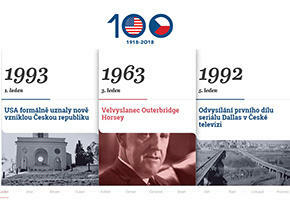 To commemorate 100 years of friendship between our two nations, we have launched in partnership with the creative agency MARK/BBDO an interactive online centennial timeline to showcase historical milestones in the U.S.-Czech relationship. This year marks a special occasion – the Centennial of the founding of Czechoslovakia and the establishment of formal U.S.-Czech relations. In 1918, Presidents Woodrow Wilson and Tomáš G. Masaryk worked together to turn the dream of an independent, free Czechoslovak nation into a reality. The U.S. Embassy Prague is celebrating this milestone throughout 2018 with all of the people of the Czech Republic. A key part of this initiative is a special website, www.ceskoamerickestoleti.cz, designed in collaboration with the creative agency MARK/BBDO through a public-private partnership. The website will include key events from U.S.-Czech history in areas including commerce, culture, sports and diplomacy. The timeline will be unveiled on a monthly basis and will include a suggestion box for the public to recommend timeline milestones additions throughout the year. This year, we are also celebrating this historic anniversary through special events throughout the Czech Republic each month to mark key aspects of U.S.-Czech relations. You can learn more about our upcoming schedule of events, organized by monthly theme, and how you can participate on our centennial page. Presidents Woodrow Wilson and Tomas Garrigue Masaryk worked together to turn the dream of an independent, free Czechoslovak nation into a reality. On January 8, 1918, U.S. President Wilson gave a speech to the U.S. Congress outlining a set of principles to end World War I, including the right of ethnic groups to form their own states. The United States then hosted President Masaryk and other prominent Czechs and Slovaks when they signed the Pittsburgh Agreement on May 31, 1918 the first step towards the establishment of an independent Czechoslovakia. Masaryk drafted the Czechoslovak Declaration of Independence in Washington D.C., also known as the Washington Declaration, in October, 1918 and he was elected the first president of Czechoslovakia on November 14, 1918. Two days earlier, U.S. Assistant Secretary of State William Phillips announced that the United States recognized Karel Pergler as the Czecho-Slovak National Council’s Commissioner in Washington, thereby establishing diplomatic relations.